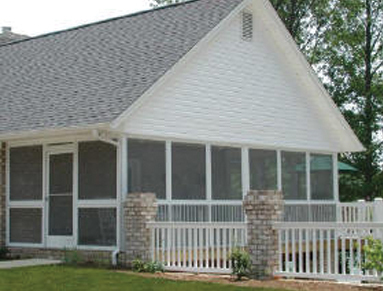 The versatility of a West Total Comfort Screen Porch Enclosure is reason enough to extend your living space at a modest cost, while adding to your home's practicality and beauty. Each custom-designed enclosure uses heavy duty screens, for durable, maintenance-free enjoyment. Adding on to your home has never been this quick and easy. West Total Comfort Rooms and Storm/Screen Enclosures are engineered to your precise specifications at the West Window plant. Rooms can be fully erected in less than a day for most applications, trimming days off traditional construction methods. Screen Rooms are available in white, bronze or tan, to suit your space. In addition, A high quality insulated roof system is available as well. Easy care and maintenance freedom extend enjoyment of your new space. Last, but far from least, your new room is covered by West Window Corporation's lifetime limited warranty as well as the roof manufacturer's warranty.Now, all you have to do is relax. Order your new West Total Comfort Room or Screen Enclosure today. We'll take care of the rest.